Every month I host a Montessori inspired co-op at my home. For the month of January our co-op theme was studying the Polar Regions. We discussed where the Polar Regions are located by using our globe as a visual. The children were able to visualize that the Arctic Circle is located at the north pole and that Antarctica is located at the south pole. Then we discussed the similarities and the differences between the two poles. In this post, I am going to concentrate on what we learned about the Arctic Circle located in the north pole. 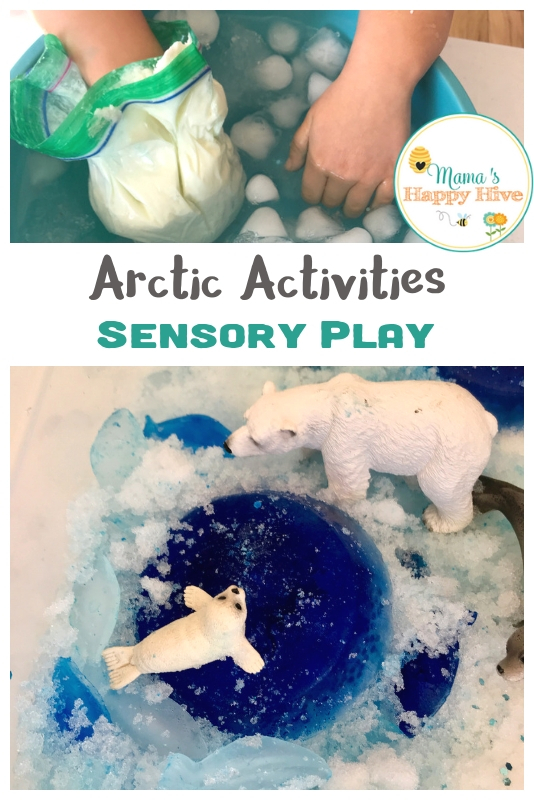 I have some awesome Arctic activities and sensory play to share with you. 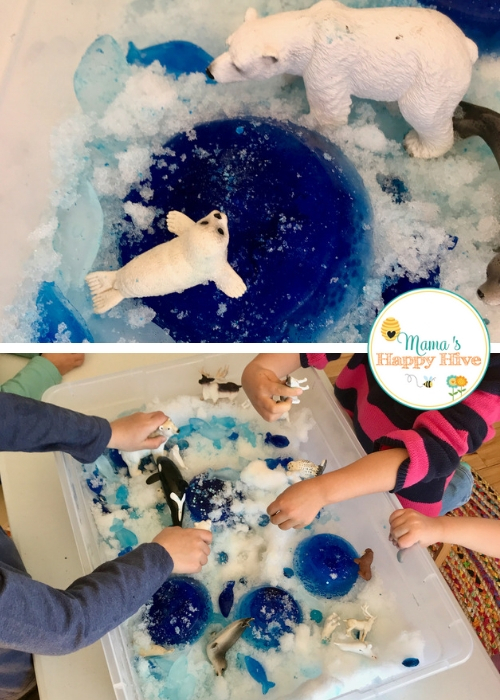 We explored a cold Arctic sensory tray, learned how blubber keeps the animals warm, crafted polar bears and igloos, and built an ice-gliding machine from LEGOS. I always begin our co-op time together by reading a few books with the children. All the children sit on circles around my reading chair. We enjoyed reading the "Arctic Tale" by Becky Baines to learn about the life of the polar bear and walrus. 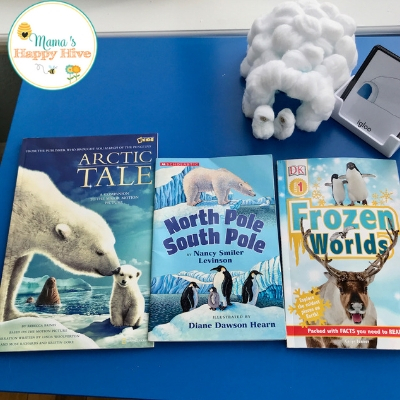 We also read "North Pole, South Pole" by Diane Dawson Hearn to understand an overview of the differences between the north and south poles. After reading books about the Polar Regions, we jumped right in to the activity part of our co-op. I filled a big plastic bin up with a shovel of snow and frozen blue icebergs. (If you do not have snow for the base, you can make snow or freeze winter slime.) I made the blue icebergs by freezing water and blue food dye in plastic bowls. I also added frozen fish to the tray with this neat ice-cube fish tray. 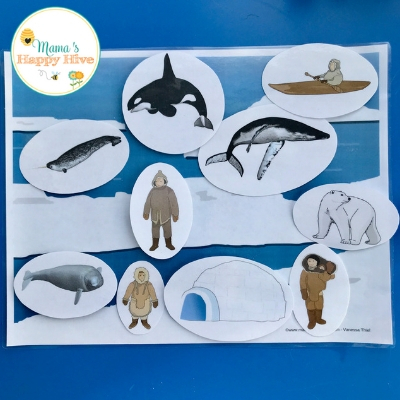 The last thing I added to our Arctic sensory bin was animals that live in the Arctic Circle. I used the Arctic Safari Ltd. TOOB and also my collection of Schleich animals. The children love getting their hands into the sensory bin to explore the various sensations of the cold grainy snow and slippery ice. They chased seals with the polar bears, pretended to be noisy walruses, and swam the Orca through the snowy water. Next we crafted polar bears and igloos. I cut out outlines of polar bears onto black construction paper for the children. Each child received a polar bear, glue, and cotton balls. 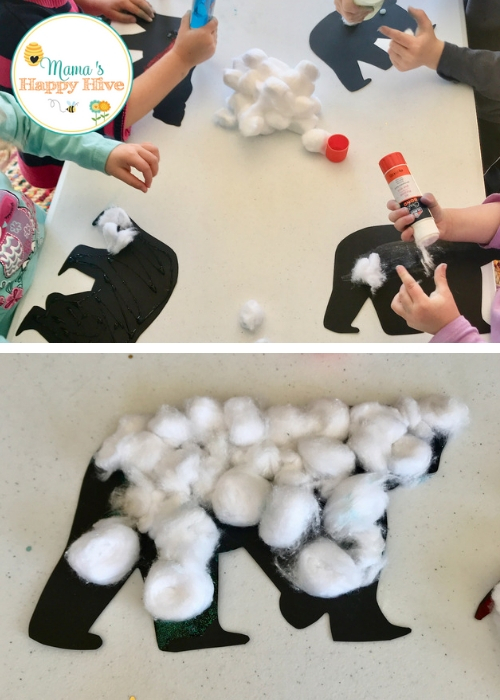 They enjoyed gluing cotton balls onto the black polar bears. While the children worked, we discussed interesting facts about polar bears. We talked about how polar bears have black skin and clear hair. Their skin is black to absorb the sun and help keep them warm. We discussed how polar bears and penguins are different. The children verbally listed all the differences and noted that polar bears are mammals while penguins are flightless birds. We also talked about how mammals nurse their young. Little Bee and I also made igloos out of plastic bowls and cotton balls. We cut two plastic bowls in half (cut the lip off) and then taped the two bowls together. Then we cut a door in the front. After that we glued cotton balls all over the bowls and added little wooden peg people to live in our igloos. Finally, we ended our co-op with a science experiment to learn how blubber protects the polar animals and keeps them warm. I filled up a sandwich bag with vegetable shortening and then pressed another sandwich bag inside. That way there were two plastic bags with the shortening in the middle. Then I filled up a bowl with ice water. 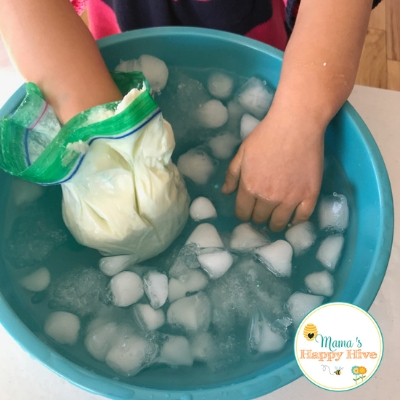 I had the children put their bare hand and the insulated hand (surrounded by the bags with shortening) into the bowl of ice water. We timed the children with a stop-watch to see how long they could keep their bare hand in the water compared to the insulated hand. The bare hand didn't make it longer than 10-15 seconds, but the insulated hand could of stayed in the ice water for a very long time. The insulated hand actually came out warm. It was a cool experiment and the children really enjoyed it. After co-op, Little Bee built an ice-glider machine from LEGO and worked on three part cards of Arctic transportation. These awesome three part cards are from Every Star is Different. Little Bee loved learning about the Arctic transportation and discussing how these interesting machines travel over the snow and ice. 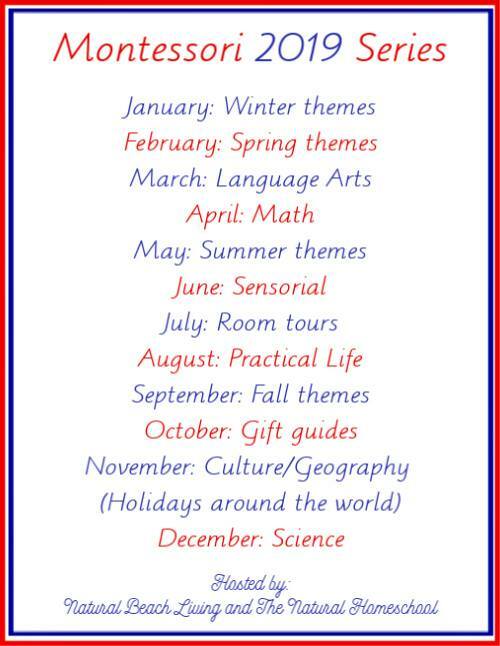 For our Montessori shelves, I created several Polar Region printables. I created a diorama of the Arctic biome with images of Inuit people, fish, and animals that live there. Your child can place the images on the diorama. This can be used as a worksheet and the child can glue the images onto the sheet or it can be laminated. I laminated our diorama and added velcro dots to attach the images. 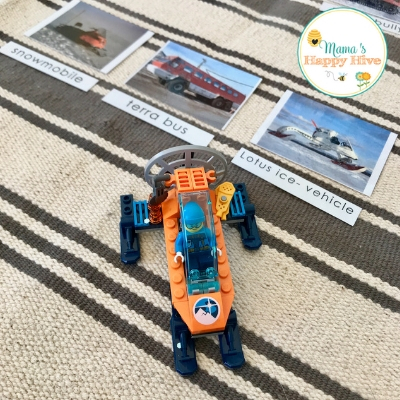 You may also enjoy other Polar Region posts I have written for more learning with play fun!